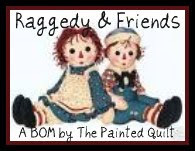 The Painted Quilt: Another Sew Along? 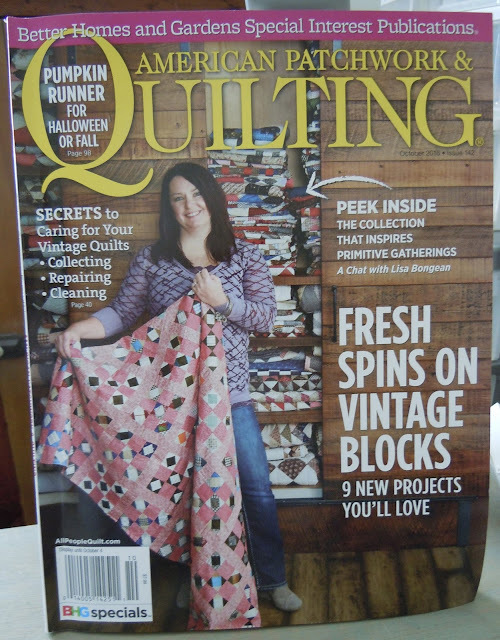 I L-O-V-E the October 2016 issue of American Patchwork & Quilting! Not only does it feature an article about Lisa Bongean but it also has a few quilts that have easily been added to my TO DO list. Well, you know me and anything vintage. "Cheddar Broken Dishes" is going to be my next quilt. To quote and paraphrase historian Barbara Brackman, "The maker of this antique quilt incorporated a popular 'four-patch' unit and the name 'broken dishes' came about in the 30's when designer and author Ruby Kim was writing about pattern history. The pattern of four triangle squares actually dates to the 1780's which is when Americans first started piecing quilts." I've had this beautiful cheddar yardage that I purchased from Tara Lynn Baisden when she had her online shop several years ago and was just waiting for the P-E-R-F-E-C-T project in which to showcase it. And if you can believe it, I can make this entire quilt from my stash! Woo hoo! This is going to be a very slow one for me because I have to rely on outside help from my friends to help me with the cutting as I still can't stand up without the total aid of my walker. In addition, my hands still tremble both from the residual effects of the anesthetic from the surgery and not to mention the withdrawal from the heavy duty pain killers I was on for so long. But things get better every day, including my strength and endurance. So, are you up for another sew along? You can do...there never should be a rush when we are doing what we enjoy. I hope everyday finds you better than the day before. I really like that issue, too, and actually considered making that quilt (it is a beauty), but I have myself on a "no new large quilts" diet this year, while I finish up the little ones piled in my sewing room. Wish I could come by and do some cutting for you. Glad to hear you see continued improvement! I'm going to pass on this one, but I did see a quilt today that made me think of you! 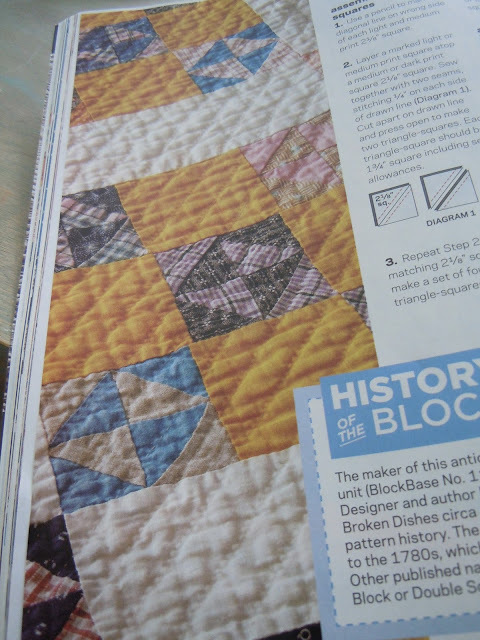 I received an older copy of American Patchwork and quilting that had a yellow and white quilt that totally stopped me in my tracks!!!!! No new quilts in my budget right now, but this will definitely be on my wish list. A girl can never have too many yellow and white quilts, right? I'd love to, and am definitely going to look for this issue when I get to the store, but I haven't even gotten a start on the last one yet! A couple baby quilts and a wedding quilt and then maybe ... So happy to hear you're getting stronger all the time, that's the best news! It's so good to hear that you're improving. Remember that having someone help you is a blessing to both! I'm originally from Wisconsin, and I do love my cheeses! So yes, I'll be sewing along on this one. I may choose to make mine a throw size. And I'm going to figure out a way to only use my stash, except for the 'cheddar' I might need to buy that. So great to hear you are feeling better. What did you have in mind for a Sew along? I have this magazine. I couldn't resist buying it. I think I would use 2 inch strips and the easy angle ruler to make the broken dish blocks. It would make a larger block, but would make the cutting easier. And I could use my pre cut scraps to make it. The cheddar squares would be cut at 3.5 inches. I need to buy the cheddar fabric though. But the rest could come from my stash. I'm glad you are starting to feel a bit better and that you have friends that are willing to help with the cutting. Hugs!!!! So glad to hear you are improving. I'm glad for your recovery. I'm recovering from knee replacement so I understand your plight. But I pray you are on the up side of things. I did your Stop Me in My Tracks sew along and still need to quilt that one. The top was finished just before my surgery mid July and once I was functioning I had a quilt that needed to have the hand quilting finished and binding done for our guilds quilt show in two weekends. I'll quilt it quilted as soon as the show is over. It's going to be my summer quilt. Great to receive your email and know you are doing much better...healing takes time. I wish I had your energy and ambition to get so much done - love receiving every email so hope you continue to keep us rockin and rollin. It's so good to have a goal, and a great magazine to dream over as you recuperate. Blessings to you- you have endured much. I love your attitude of moving forward- slowly and surely. I loved this issue of APQ, also! Barb Vedder, from the blog Fun with Barb is having a block exchange. The Civil War exchange is closed, but I believe there are still spots open in the Modern Swap. The block- broken dishes! I will be sewing and exchanging and I will get this quilt done! :) Enjoy your day and happy stitching! "Better every day" is fabulous, Kaaren! How 'bout I work on my Vintage Autumn quilt while you work on your cheddar quilt?!? We have four weeks of harvest left so maybe you and I will be ready at about the same time?? Take care!! Woohoo, does this make me happy! I am thrilled to see that you have your quilting mojo well in tact. I wish I lived closer, I would spend the day with you cutting. In fact, if you run shot of friends to help, please feel free to send yardage to me and I will cut and ship back. Enjoy your quilting time! 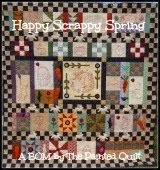 I love this quilt, will have to get out and get my copy of American Patchwork & Quilting. Happy to see something that inspires you. Making this quilt will definitely help with your rehab, and the fact that you have close friends to help you is wonderful. Take care, Kaaren, and enjoy the process if you can. You will have a fabulous quilt when finished. They work great and are very inexpensive. They might work for you. I have no affiliation with the product, lol. They just worked great for me. Continue to get better! This is not about quilting although I do some myself. 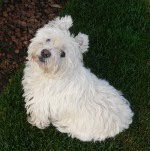 I havenot seen anything about your cat and dog in quite sometime? I understand that guys make wonderful, precise cutters. 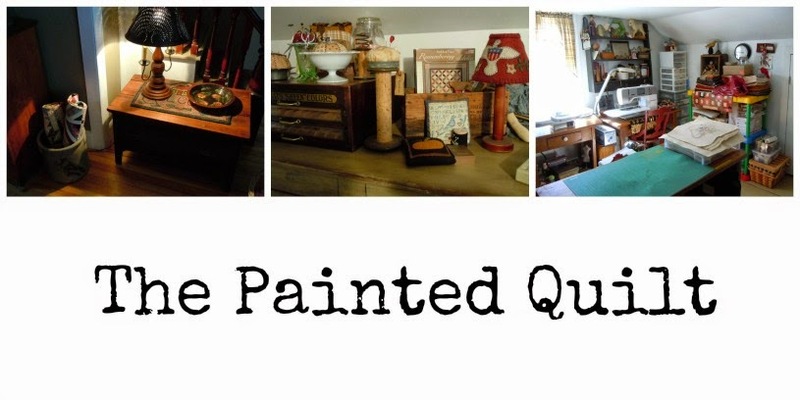 Maybe you could enlist the services of Mr.Painted Quilts to help in the cutting process. It will be lovely for sure. You have had quite a journey, Kaaren. Hopefully now it is at a state of wellness you can be satisfied with. I am so glad you are finding inspiration in the midst of recovery...our quilting is so important and that quilt will be a beauty in your still capable hands.